How aware are you of the dangers inherent in your hometown? Does your level of awareness increase or decrease when you travel to another city? These questions recently came to the forefront of my thinking, when planning a trip home to New Orleans. We were bringing some "first timers" along for the experience. So, what should you attitude be traveling to a new city, especially one with a reputation for a "relaxed" approach to drinking, physical contact, and, unfortunately, street crime? 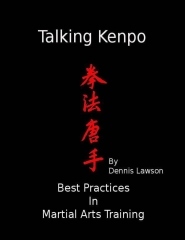 The first lesson comes straight out of Ed Parker's Infinite Insights into Kenpo Mental Stimulation (Book 1). You must first embody an attitude of awareness and understand that danger exists and it can happen to you. Once you've understood this perspective, you must change certain behaviors. If you're walking in New Orleans' French Quarter (the oldest area of the city), wear good comfortable walking shoes as the old streets are often dangerously uneven. Carrying a purse or a backpack is an invitation to purse snatchers. Fanny packs are a less attractive alternative, better yet; carry what you need for sightseeing and small purchases in you pockets. For men, I recommend carrying your wallet in you front pocket and your cash in your other front pocket. The front pocket carry is much more difficult for the pickpocket to access and by separating your cash you can make small purchases without accessing your wallet. By changing the above habits, you come to understand the next lesson. Environment is everything in you, on you, and around you. Your internal environment (in you) changes remarkably after a great meal and a Hurricane or a few Sazeracs (popular New Orleans cocktails). As for around you, each external environment has a reference point or set point. How bright or dark is the lighting? What's the traffic like? How many people are on the street? What sounds do you hear? How loud or quiet is it? How does it feel to you; crowded and claustrophobic or deserted and ominous? Realize that this set point can change just as the set point on an air conditioner can be adjusted. The French Quarter is a completely different environment in the morning during the workweek, than it is during Mardi Gras or Jazz Festival. It’s also important to be aware of our personal bias toward avoiding conflict. This tendency may have a genetic origin allowing us to survive better as a species. However, this conflict avoiding bias can affect our ability to perceive danger before it happens (see my prior article on Pre-Incident Indicators). Learn to trust your intuition. It's estimated that we are exposed to 2 million bits of information every second. The unconscious mind takes all of this in. Our conscious mind can only process about 134 of these bits in a second and can only remember about 5 to 7 bits (short term memory limits). The source of intuition is your unconscious mind. Learn to trust what it tells you and act on that information. Training your awareness is a skill. Just as I've given examples of dangerous scenarios, greater awareness can have positive benefits. Through training, you may notice a beautiful sunset, the sound of music coming from a passing car, or that refreshing feeling of a cool breeze on a hot day. For training purposes, concentrate on keeping an erect posture and allowing your vision to scan from left to right. Listen and attend to the sounds around you. This can also help quiet your internal self-talk calming both your mind and body. Breathe deeply, relax, and stay alert to both sides of life - the dangers and the joys!